"Although the US will remain the leader in RTB spending through 2016, Japan will surpass the UK in 2014 for the No. 2 spot in terms of ad dollars. 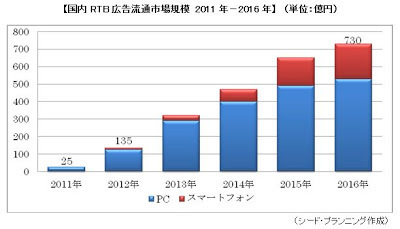 By 2016, IDC predicts RTB display ad sales will account for 28.5% of total digital display dollars in Japan. 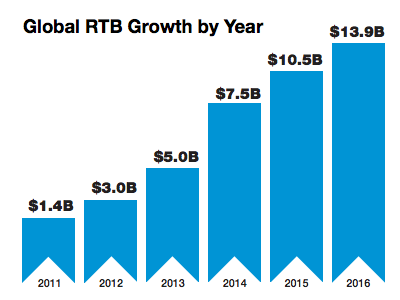 … On the heels of Japan’s impressive RTB uptake, the Asia-Pacific region will continue to dominate growth in the market in 2013"
"Where do you observe the biggest pain points are for marketers in the RTB ecosystem? One of the most significant challenges for marketers is the lack of measurement consistency. There’s been a lot of talk about channel integration in the RTB space, but marketers still have to face a lot of technological and workflow challenges. Fortunately, industry insiders openly acknowledge that online advertising lacks solid, intelligent attribution models so the market is at least moving past the “turning a blind eye” stage. Agreeing on a consistent RTB “language,” defining standard RTB APIs and establishing a common set of metrics to evaluate success will become critical to vendors’ efforts to bring more marketers on board." 最も大きなチャレンジの一つに、計測の一貫性の欠如が挙げられます。チャネルの統合についてはRTB界隈でよく話題に上がりますが、マーケターは技術面・ワークフロー面でまだまだ多くの問題に直面しています。幸いなことに、業界では "オンライン広告には信頼できるまともな貢献度分析が欠けている" ということが共通理解になっており、少なくとも市場は "見て見ぬふりをする" フェーズは超えたといえると思います。RTBの "用語" の共通理解を進め、RTBのAPIを定義し、そして、キャンペーンを評価するために業界で標準的に使える指標を確立することは、RTBをマーケターに浸透させるために各ベンダーがやらなければならないもっとも重要な作業になるでしょう。"
As was the case last year, much ink has been spilled on publishers’ concerns around sales channel conflict, price deterioration and brand erosion. They’re certainly ongoing concerns on the publisher side, but the industry has moved a long way in the last 12 months. Vendors have been making strides at educating the market, so publishers are releasing more inventory (in some cases even premium placements) to supplement the efforts of their direct sellers. It’s certainly not only bad news, especially when it comes to private marketplaces. Making deals via private marketplaces is sometimes seen as a more conservative way of getting started with programmatic buying. They are increasingly used among publishers with high sell-through rates, as they’re looking to restrict inventory access and get the maximum price on every available impression." "Programmatic premium channels are new automated access points to publisher inventory where the pub is getting paid more because the advertiser is getting more value – viewability, preferential treatment or 'premium placement." "In the rest of the ad business, when you allocate your media budget, you expect this budget to be spent. This has not been the case with real-time bidding -- the fastest growing segment of digital media. Until now." 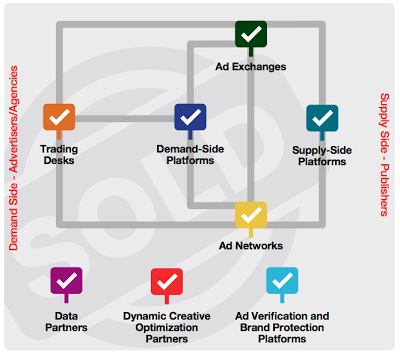 "Real-time trading (or real-time bidding, or RTB) has always been about the "spot" market -- the non-guaranteed. It's the inventory the sellers can't sell. Chief revenue officers at top comScore publishers and media heads at leading agencies are amused, and often confused, by the spot market's complexity. They know that the real money is in guaranteed budgets." "Programmatic guaranteed (also known as "futures" or "programmatic premium") combines real-time trading and automation with guaranteed, 100% book-to-run budget capability. It's the ad-tech world and the "real" world, together at last." "Programmatic guaranteed (もしくは"programmatic premium") は、リアルタイム取引と、予算内での掲載保証つきの自動化を同時に実現するものです。アドテクワールドと"リアル"（これまでの広告ビジネス） の融合です。"
While digital advertising now gets the majority of media spend in the UK when taken as a single channel (30% vs 26% for TV), when you examine brand budgets, the IAB estimates that just 13.5% of digital advertising is brand-based rather than direct response. The growth therefore has largely been in the performance sectors. Brands like the idea of automated buying, but they also want the right type of inventory and the right measurement model that will allow them to run both brand and performance campaigns via RTB.